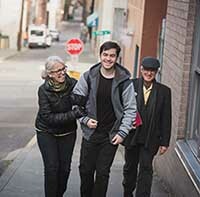 Do not block the parking garage entrance to Pagliacci's on Pike Street or the Dunn Automative Residence Building on Summit Avenue. There will be a few bumps because it is the beginning of the school year. As the year progresses and habits are established, the drop-off and pick-up should go more smoothly. Middle School Director Sue Maul will host a parent coffee and Q&A session for new Middle School parents in the Main School Building Theatre, at 8:05-9:00 am. There will be an orientation for students new to the Middle School starting at 8:00 am. Students will be greeted at the door and directed where to go. New students should bring their backpacks and a writing utensil, but do not need any of the other classroom materials purchased this summer. Teachers will let students know what they should bring back with them for the first day of classes on Wednesday, Sept. 5. Returning Middle School students should arrive at school before 10:00 am in time to be present for Morning Meeting in the Main School Building Theatre, which begins at 10:00 am. Students will receive class schedules (including PE and arts placements), and advisor and locker assignments. We will go over basic procedures, expectations, and policies. In addition, all students will have their picture taken for our hall photos, and we will be offering pictures for photo packages to be ordered for home use on this day. There will be an orientation for all 9th graders and new students to the 10th and 11th grades beginning at 8:00 am. All seniors must attend the Senior Breakfast and Environment Training from 8:30–10:00 am, in order to be fully prepared to assume their leadership roles in the Environment Program. Seniors will also have their ID photos taken on Tuesday, and should be free to leave by 3:00 pm. Students should bring their backpacks and necessary materials for the first day of classes. Teachers provided (or will provide) students with instructions on which books will remain at home, which books will remain at school, and which books will travel between. Middle School Parents: On Wednesdays, classes end at 2:40 pm. Since there are no Office Hours the first week of school, please arrange pickup with your student(s) at that time. For more detailed information about the first week of school, please read the full letters from Middle School Director Sue Maul and Upper School Director Chance Sims. All of our fall sports teams have their first contests of the season next week. Come on out and support the House! Keep track of all of the sports' schedules here. Welcome Back and Bon Appétit! The dining hall crew is excited for a new year of connecting the community through food. Community to us is not just The Northwest School community. It is the farmers who grow and harvest our food, the vendors who we purchase food from, and the people who transform our food waste into compost. It takes many hands (including you!) to support a sustainable food system—from seed, to table, to compost, to soil. Want to be involved in the dining hall at Northwest? Find out what we are doing in the kitchen by following us on Instagram @nws.kitchen. E-mail Bethany if you have suggestions for the “Question of the Day” board, would like to help with the chalk art, menu board or Farm-to-Table board, or want to suggest a recipe for lunch! You can also drop us a line if you have questions about the menu or want more information about ingredients and allergens. Erin Miller and Veronica Leyva will discuss next steps in the college application process, highlighting processes, available support, and important deadlines. All seniors and parents/guardians are strongly encouraged to attend. The program will begin with announcements from members of the Upper School administration, and the college portion will immediately follow. Erin Miller and Veronica Leyva will introduce juniors and their parents to the college search and application process, highlighting next steps and important events. 11th grade students and at least one parent/guardian from each family are strongly encouraged to attend. The program will begin with announcements from members of the Upper School administration, and the college portion will immediately follow. Follow The Northwest School on Social Media! Make sure to follow us on the various social media platforms. You can follow us on Facebook, Twitter, and Instagram. We also have a special Instagram feed devoted to environmental sustainability. Go to website home page and click on "Calendar." Click the box titled "Other Event Actions." 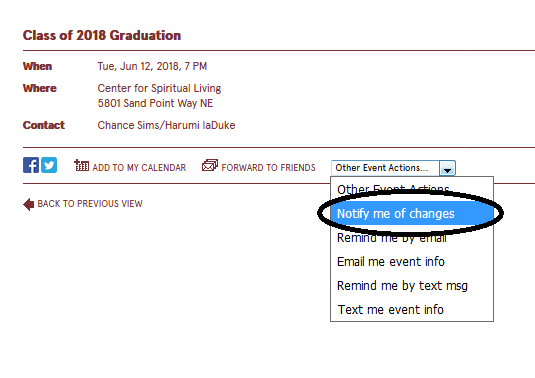 Click "Notify me of changes." Fill in your email address on the next window that opens. The next time there is a last minute time, date, or location change, you will get an email notice. 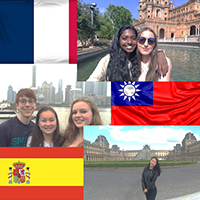 This year, we will be offering three Study Abroad Program opportunities for 10th graders, during Trimester 3, at our partner schools in France, Spain, and Taiwan. On Sept. 20, at 6:30 pm, in the Commons, we will have a presentation for the families of sophomore students during the Parent/Guardian Night. Students who are interested in applying to participate in the Study Abroad Program should plan to attend a meeting on Sept. 21, during Flex time, in the Physics Lab. We would like to remind all parents (especially NEW parents) to please take a few minutes to fill out your Volunteer Interest Form, and your Grandparent & Special Friend Form by Sept. 15. Applications for admission to the 2018-19 school year are being accepted starting today. For current families and faculty members with a child applying to 6th grade, please note that Early Sibling & Faculty Child (ESFC) applications are due October 19. For more information about the ESFC application timeline, and the admission process for siblings and faculty children applying to grades 7 and above, please click here, or contact our Admissions Office. Over 100 colleges visit The Northwest School in the fall trimester to meet with prospective students. In addition to coordinating these visits, the College Office offers resources and events to support 12th graders in the college application process and 11th graders as they begin the college search. Please click here to view college counseling announcements, upcoming events, and the college visits schedule. You're receiving this because of your affiliation with The Northwest School.